WW Eyes Open, who is now Fergus, was adopted by our GAGC Treasurer, Mary and her mom, Joyce. We knew he was a special boy because his kennel manager in FL told us how sweet he was. Thanks to Debbie, who fostered him and helped him learn how to live in a house while Mary had her fence installed. Not pictured is Mary's first special greyhound, Fiona, who was thrilled Fergus arrived :) she didn't want in the family photo. Mary adopted Fiona in 2011, she adopted Taj in 2012 who died 11/18. She adopted special girl, Bluebell in 2015. Mary and her mom have HUGE hearts and LOVE their dogs! 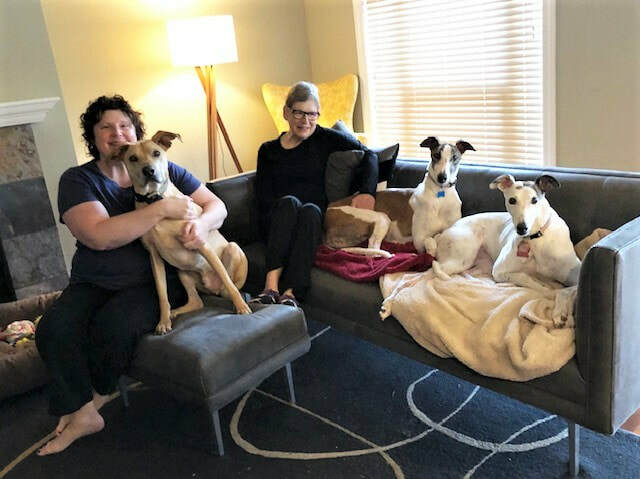 Pictured is Milton, who is next to Mary, Joyce then SPOILED ALREADY, Fergus and their sweet Bluebell greyhound, who immediately took a liking to the new family member! Needless to say this boy is a VERY LUCKY hound to have found Mary as his human. Be sure and come to the May picnic so you can meet him!